This is the time of year for savory pastries! (somebody told me I say the word “savory” too often. And perhaps I do, but somebody’s got to!) They’re so warm and comforting, and they’re the perfect solution to the problem of trying to feed vegetarians a holiday meal. Or to feed non-vegetarians a meal special and satisfying enough that they don’t miss their meat. Let’s start with the grandmother of all savory pies…the Empanada Gallega. This empanada is probably the source of empanadas all over the world. It hails from Galicia, in Northwestern Spain, and it’s a large flat pie that would be cut into pieces. I’ve never been to Galicia, and I’ve never eaten a genuine empanada gallega, but I’ve been so taken with the idea of it, and I’ve read so much about it, that I feel like I have! 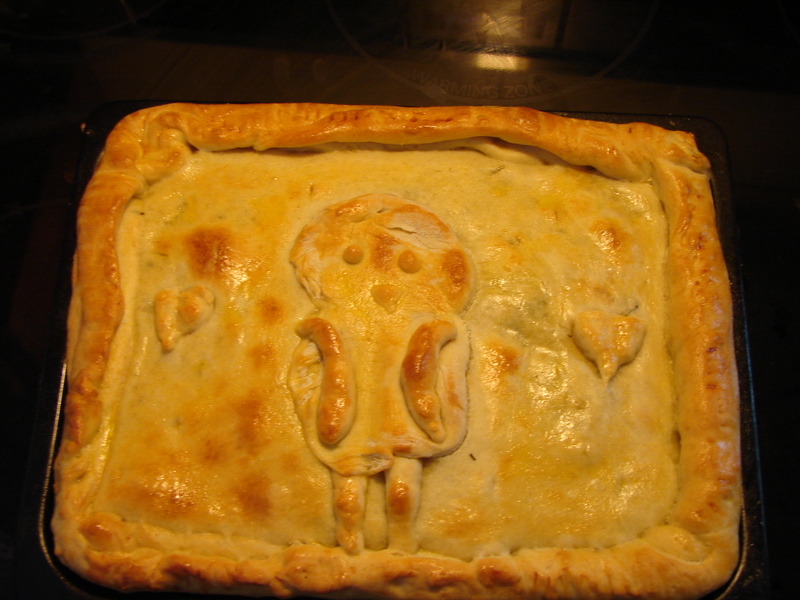 I’ve cobbled together a vegetarian version of my idea of an empanada gallega. It’s delicious, relatively simple to make, and it feeds a lot of people. I believe that seafood, specifically tuna, is used in the real version. I’ve experimented with different types of vegetables…mushrooms, eggplant, spinach, zucchini. The combination I like best, in the end, is artichoke hearts and zucchini. Baby spinach would work well in that combination, too, if you’re in the mood. If you’re not a fan of zucchini, you could stick with artichoke hearts by themselves. Whatever you like! We’re making it up as we go along, so it’s very adaptable. You know what would be good? Artichoke hearts and roasted red peppers. I’ll try that next time!! 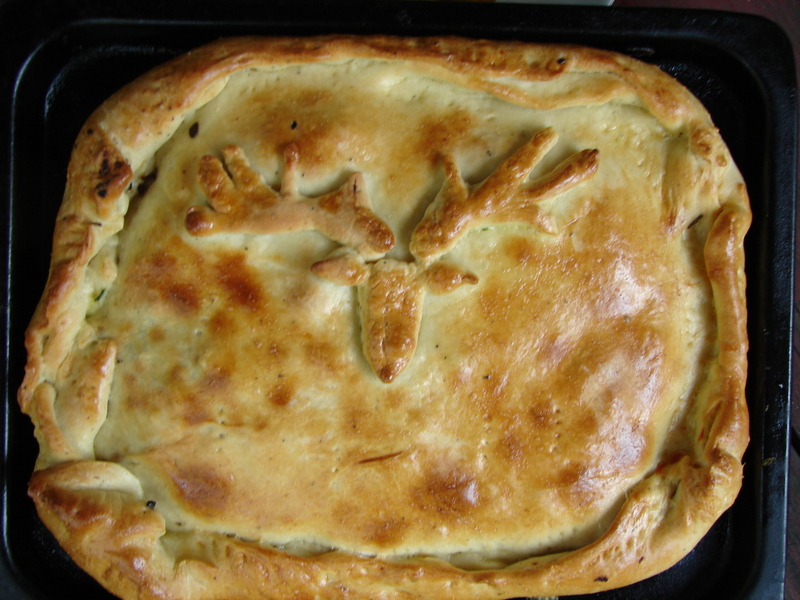 In Galicia, the patterns on the pies help to identify what kind of filling is inside. Since I just make one at a time, we just have fun with them. My son made the owl! Dissolve the yeast, sugar, and salt in the warm water, and leave till it’s foamy – about 10 minutes. In a large bowl, combine flour, salt and white pepper. Make a whole in the center, and add yeast mixture, olive oil, egg, and wine. Mix it all together. Add water or flour as needed to make a workable dough. Knead it for about 5 minutes, and then set it in a warm place for an hour or two. Warm the olive oil. Sautée the shallot and then the garlic. Add basil, oregano, and then the vegetables. Mix well, and continue to stir fry till they’re a little bit brown, but not too mushy. Mix the vegetables with the cheese. And season well with ground pepper. Divide the dough 2/3 to 1/3. Roll out the larger portion to fit your baking vessel. I actually use my toaster oven tray, because it’s a nice size and it has short straight sides. But you could use a larger tray, or a 9 X 9 (or so) cake pan. Whatever you have. I believe traditionally these empandas are rectangular, but any shape will taste as good! Grease and flour whatever you’re baking this in, and then roll/stretch the dough onto the pan, overlapping the edges slightly. Spread sofrito all over the dough (Minus about 2 inches on all edges, if you’re doing this flat. Spread the veg/cheese mixture all over the sofrito. Roll out the remaining 1/3 of dough to just fit the base, lay it on top, and roll the edges up all around, pressing them together as you do. A fork can be helpful here! Make a pretty pattern on the dough with any dough you have leftover. Make some holes in the top to let the steam out. Brush with beaten egg, and bake at 425 (preheated oven!) for 1/2 hour – 40 minutes, till the top is golden brown and shiny and crispy. This entry was posted in basic pie filling, crust, mushrooms, pie, recipe and tagged artichoke hearts, sofrito, vegetarian empanada, vegetarian holiday main course by Claire. Bookmark the permalink.